The custom installation professionals at Calgary, Alberta-based Creative TSI are teaming up with the homebuilders at Astoria Custom Homes to create a truly one-of-a-kind home entertainment experience room that uses the ELAN g! 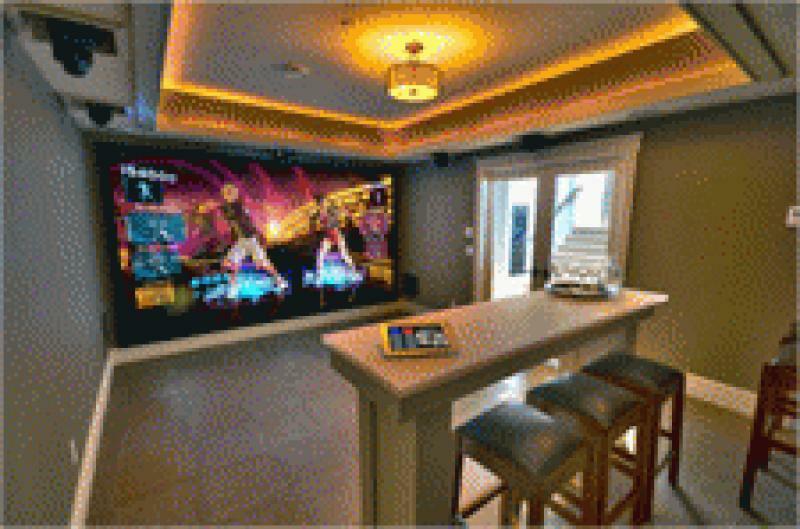 Entertainment and Control System to make gaming, movies and partying easier and more fun than ever. • Read more AV dealers and installers news from HomeTheaterReview.com. Triggered by simply docking an ELAN g!Mobile-equipped iPad 2 in a magnetic Launchport dock, this room comes to life and automatically turns on the Runco LS-HB hi-def projector, club-style pinpoint lights and Xbox 360 with Kinect, brings up the house lights, starts a hidden fog machine and completely preps the room for an amazing movie night, dance party or gaming session. With an entire wall occupied by a 151-inch Da-Lite Cinema Contour Screen and motion-based control through the Kinect device, the room presents an augmented reality environment that proves home entertainment is no longer a strictly passive experience. In conjunction with Runco, the enormous screen was made possible using a precision optical dual-mirror rear projection system, so the projector isn't located inside the room, but instead in a room adjacent to it. That was important to Creative TSI President John Lattion, who said "You can't achieve this kind of functionality with a projector in the usual location in back of the room, as the players would obscure the projector's output by standing/jumping in the play area, and the fog machine would obscure projection output as well. Perhaps even more beneficial for the homeowners, the room is completely void of any equipment that can be seen! All you can see is the iPad/Launchport and the screen. Everything else is recessed or hidden." To make the most of the 2012 Street of Dreams at Willow Creek at Bearspaw home design event, Creative TSI designed augmented reality room that combines technologies from ELAN Home Systems, Runco and Microsoft. The 6-week home event features four of the area's leading homebuilders, who each teamed up with their own subcontractors to make their home's landscaping, interior design and cutting-edge technology stand out from the rest. The $2.6 million home was designed and built by Astoria Custom Homes, Alberta's premier custom homebuilder. The Astoria Custom Homes house at the Street of Dreams home design event features a whole-house Centralite Jetstream lighting system, DSC security system, a total of 14 audio zones with 24 ELAN in-ceiling speakers and 4 ELAN outdoor speakers, 4 wall-mounted Samsung LCD TVs, 3 Launchport wall docks and one tabletop Launchport dock that each activate room-specific, pre-programmed ELAN g! scenes for lighting, heating and entertainment. Also integrated with the ELAN g! System are 3 Honeywell surveillance cameras, a smoke detector and a carbon monoxide detector. The home is prewired for a prospective buyer to add climate controls and additional TVs, speakers and in-wall ELAN g! touch screens or iPads. For show dates, times, tickets and more information visit www.streetofdreams.com. How HAUS Is Helping Dealers Make a Smarter Home Adrienne Maxwell pays a visit to the new Home Automation University (HAUS), a member-based business education company aimed specifically at the blossoming smart-home market.